Stock status is current as of 4/24/2019 12:14 AMET. 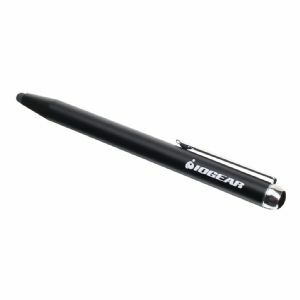 IOGEAR's Accu-Tip Stylus for Tablets and Smartphone is an essential tool for your iPhone, iPad, Galaxy S4, Galaxy Tab or other capacitive touchscreen device. The slim, 4.5mm touchpoint provides accurate response that is perfect for signing important digital documents or creating artistic designs with drawing apps. The metal body construction provides balanced weight and a solid feel in the hand for comfortable use. The low friction touchpoint tip glides smoothly across the surface of your display without leaving marks. The Accu-Tip Stylus is perfect for students taking class notes, artists creating digital paintings, and merchants or bankers that require a verifiable electronic signature. Additionally, IOGEAR's Accu-Tip Stylus is the perfect tool for composing messages on devices with small on-screen keyboards, or when cold and inclement weather makes direct finger contact on the touchscreen difficult. Both digital artists and novice doodlers alike will appreciate the Accu-Tip Stylus' small 4.5mm touchpoint. When working inside digital painting or drawing apps, the IOGEAR Accu-Tip Stylus exposes more of the screen area around the tip, so it is much easier to work in smaller detail. The Accu-Tip Stylus allows a more accurate stroke which is perfect for signing digital credit card purchases or banking documents. Instead of jagged lines or odd looking handwriting when using a finger or traditional large tip stylus, the resulting signature from the Accu-Tip Stylus looks much more pen-like and easy to reference. The metal housing of the Accu-Tip Stylus feels very solid in hand, similar to a fine writing instrument. The balanced weight provides a comfortable feel for long periods of use as when taking notes in class or drawing pictures. Additionally, the body is extremely durable and will not bend or break in the bottom of backpacks and book bags. IOGEAR logos are registered trademarks of IOGEAR. All others trademarks and copyrights mentioned herein are the property of their respective owners.